If you have been searching online for teacup persian kittens for sale, you have probably encountered a great deal of conflicting information. Treasured Kittens would like to set the record straight, and give you sound information and advice about teacup persians. What are Teacup Persian Kittens? Doll Face Persian kittens are the original Persians. They do not possess the large body or short face seen in the “extreme” or “pansy face” Persian cat. Doll Face Persians are naturally small, weighing between 6 and 9 pounds fully grown. Because of their naturally smaller size and unaltered facial structure, these Teacup Persian kittens enjoy long lives, great health and exquisite beauty. What Makes Treasured TeacupPersian Kittens a Good Choice? 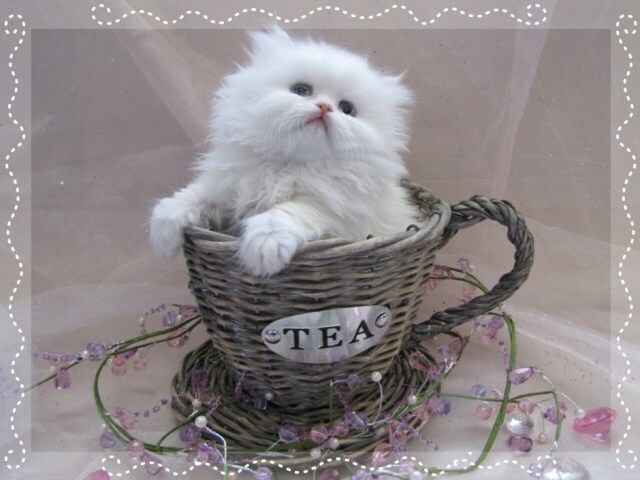 If you have never snuggled with a Treasured Teacup Persian kitten, you have missed one of life’s true pleasures. Our kittens are the cuddliest little purr factories on earth. They simply adore you, and want nothing more than to be held, pampered and played with. They are an excellent choice for well-behaved children, and make fabulous companions for all cat lovers. They are not “aloof cats” and thrive on lots of attention and care. 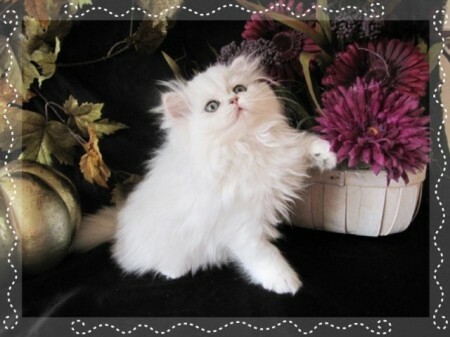 Treasured Kittens breeds only Doll Face Persians. We have devoted many years towards producing the ultimate luxury Persian kitten, and have so many success stories to share. Our kittens are first and foremost healthy. We focus on three beautiful shades in our breeding program: our Teacup Persian kittens possess thick, glossy coats in stunning colors of white, shaded silver and chinchilla silver. Our kittens have faces so adorable that they seem more like sweet china dolls than living, breathing creatures. 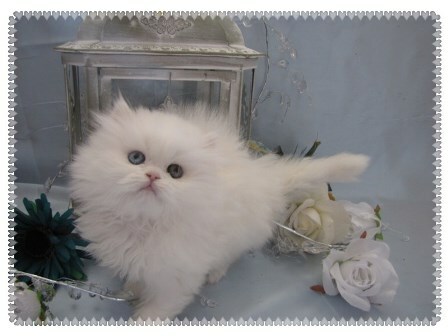 Your Quest for the Purrfect Teacup Persian Kittens For Sale is Over! Treasured Kittens offers the very best. Our many happy kitten buyers have sent testimonial after testimonial to attest to our being a reputable, caring cattery placing wonderful Teacup Persian kittens in loving homes. Whether you live here in Colorado, up north in Vancouver, Canada, down in Texas – or anywhere in the USA and Canada, a healthy, beautiful and affectionate Treasured Kittens Teacup Persian can be yours. If you would like to apply for a Treasured kitten, the first step is to get on our waiting list. Our kittens are in high demand, and we breed very selectively and carefully. There is normally a wait period of 1 to 4 months, depending on your preferences in a kitten. The sooner you are on our waiting list, the sooner your beautiful Teacup Persian kitten will be gazing lovingly into your eyes. And, of course, if you have any questions or would like to speak with us in person, please feel free to call. We’re happy to answer any questions you may have and tell you more about our passion for Persians! Thank you for your interest in our Teacup Persian kittens for sale. We appreciate your visit and invite you to drop by again soon and often to see our newest photos and available kittens. And our kitties would love it if you would share us with your friends. It makes them purr!